Lovebird or Parrotlet? – Pet Birds by Lafeber Co.
At a glance, parrotlets and lovebirds look a lot alike. In fact, when parrotlets were discovered in the 1800s — a century after lovebirds became known to Europeans — they were called “South American lovebirds,” a reference to the fact that lovebirds are native to Africa, a world away. What do these short-tailed, compact birds from entirely different continents have in common, and what makes them different? 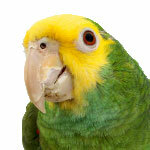 Both lovebirds and parrotlets are described as big birds in small bodies. They don’t know what size they really are, and will hang out with or stand up to much larger birds. Both are described as sometimes being “nippy” but as being adoring pets if hand-raised. Pet birds of both these species must be handled daily in order to retain their tameness. 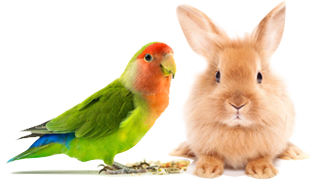 You’re making a commitment when acquiring a lovebird or parrotlet companion. 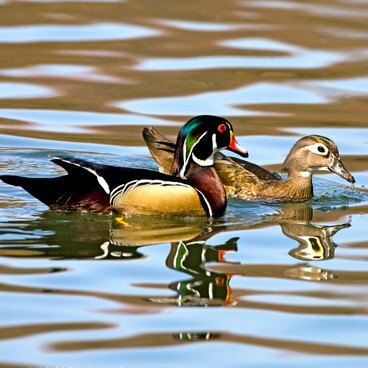 As much as they like attention and affection, neither species will do well with a bird companion. 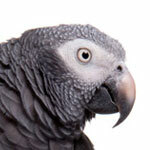 Keep one as a pet bird, or keep more than one in separate cages for their own safety. 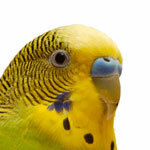 Lovebirds and parrotlets are not only bold and feisty, but also smart. Lovebirds have a reputation for figuring out how to open cage or feed cup doors and let themselves out of the cage. The species of parrotlets that are commonly kept as pets are the Pacific, green-rumped and spectacled parrotlet. Their size varies from 3 inches to 5-1/2 inches, and their weight from 18 to 28 grams. Peach-faced, masked and Fischer’s lovebirds are all 5 to 6 inches in length and are hefty birds with weights from 35 to 55 grams. Both lovebirds and parrotlets are relatively small birds, but parrotlets are 2/3 the size of a lovebird. As far as we know, both species have an expected lifespan of 15 to 20 years. Parrotlets have not been kept in captivity as long as lovebirds, so we’re still learning about their longevity. Because of their small size, high energy and curiosity, these species have a propensity to have accidents, which affects actual lifespan, too. 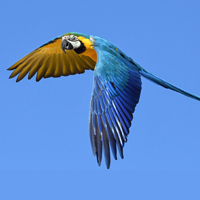 Lovebirds, like most parrots, are not sexually dimorphic. In other words, both sexes have the same outward appearance. When mature, parrotlets have visual differences between the sexes. Lovebirds have a natural call that is a high-pitched shriek. Parrotlets, on the other hand, chirp quietly and can’t squawk. Though generally quiet, a parrotlet can learn to talk, and it seems the spectacled parrotlet is the best talker among the species. Lovebirds rarely mimic noises or talk. Both parrotlets and lovebirds are active, curious and acrobatic species. They hang on their toys and love to go in things. The will hang out on a shoulder and hide under their person’s hair or slip in a pocket. Dena Tucker of CreativeBIrdToys.com reports that lovebird and parrotlet owners both purchase toys with colorful parts, toys that make noise, and toys that can be shredded. 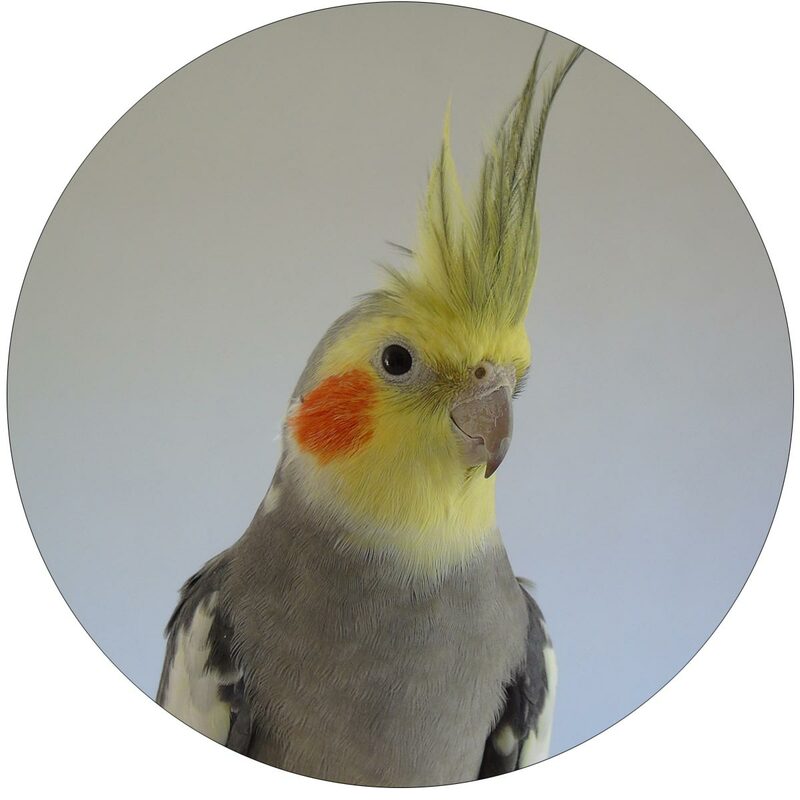 Because these are hardy birds with strong beaks, their toys should be more cockatiel or conure size rather than budgie size. Again, these are big birds in small bodies! Both lovebirds and parrotlets will enjoy being provided with a swing. Though they do like going into things like boxes or tents, this will encourage territorial breeding behavior in an adult bird so is not recommended for them. If you have a female peach-faced lovebird, you may notice that she shreds everything in sight. She then sticks the pieces of paper, palm frond or whatever into her rump feathers and flies or walks around decorated like that! It’s a nesting behavior that is not found in other lovebird species or in parrotlets. 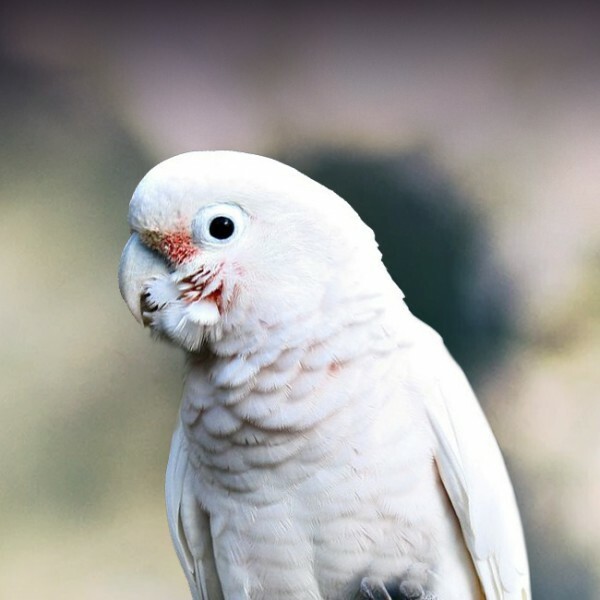 There are three species of lovebirds often kept as pets — peach-faced, masked and Fischer’s — and three species of parrotlets most often kept as pets —Pacific, green-rumped and spectacle. Get to know the species before you get your pet. 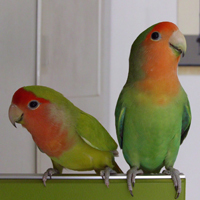 Peach-faced lovebirds make wonderful pets and come in a rainbow of colorful mutations. They stay tame, whereas there are many accounts of masked lovebirds and Fischer’s lovebirds that are tame as babies but don’t remain tame. Most pet owners keep Pacific parrotlets, of which there are several mutation colors. They can be feisty and stubborn but also loving with their owners. Spectacle parrotlets are bold, and both sexes can learn to talk. 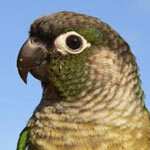 Green-rumped parrotlets can be shy but with patience can make great pets. Because they are so active, parrotlets burn up calories and should be fed more food than a lovebird or even a large, sedentary cockatiel. What you should provide more of to a lovebird, however, is the opportunity to bathe. Most lovebirds appreciate being spritzed with a plant mister or offered a shallow bowl of water in which to bathe.